We’re living in a golden age of modular homes. Also known as pre-fab homes, we at Form Homes prefer to call them pre-fab-ulous homes! Conceived in 1908 by American company Sears Roebuck and Co., it made architecturally-designed homes easier for everyone to attain. The modern-day modular design is built inside a factory, in sections or modules. It’s then shipped to a customer’s house site and constructed by a builder. Unlike mobile homes which can be picked up and moved, a modular home stays where it’s built. This high-level building system is equal in construction to other site-built homes, it just arrives at the site in segments and goes together very fast. You’ll even save on manpower as the slick Form Homes team puts it all together in a controlled, protected environment. Internal fixtures and external work happen simultaneously. The conservation of natural resources like water and electricity make modular homes a great green choice too. Modular construction is a superior building process. Weather can’t intervene and qualified builders have every high-performance tool on-hand in the workshop to create a strong, reliable, long-lasting home. The lighting is constant, the conditions dry – we have complete control over the building system. Structurally, modular homes are quite often superior to a site-built home. Each module must be able to withstand transport from the factory to the building site, so once each strengthened module is connected, you gain a home that is far more durable. Energy efficiency is an integral part of a modular home’s creation – pre-fab homes are considered a genuine form of green building. We take into account solar passive design, meaning we can angle your modular home to utilise as much sun as possible. We can even alter the façade’s finish to harmonise more with its natural environment – like upgrading from a brushed concrete finish to natural looking, carbon-capturing wood. All Australian Building Codes and Standards are satisfied. Certification still takes place and because your home is created inside a factory, many of the checks are done via the pre-fab supplier – us! Once completed, we ship anywhere – especially remotely where pre-fab homes solve a lot of remote access and cost problems. You save on builders and contractors traveling long distances. They’re all managed in the one central location by an expert foreman. This is especially beneficial in a commercial project. 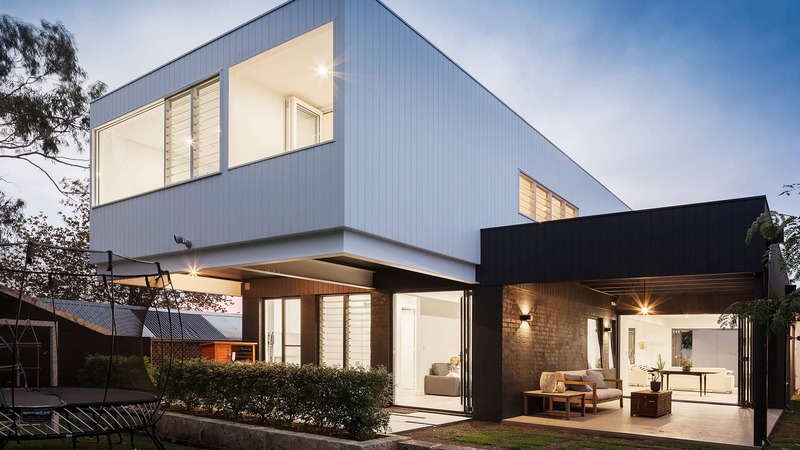 No matter where you are, city or remote country, you can see why modular homes have become so popular – they tick all of the boxes of an architecturally-designed home. Explore our range of modular homes and when you’re ready to know the joys of pre-fab-ulous, give us a call at Form Homes.